This composite of C/2013 A1 (Siding Spring) merges Swift UVOT images taken between May 27 and 29, 2014. Sunlight reflected from the comet's dust, which produces most of the light in this image, appears yellow; violet shows ultraviolet light produced by hydroxyl (OH), a molecular fragment of water. "Comet Siding Spring is making its first passage through the inner solar system and is experiencing its first strong heating from the sun," said lead researcher Dennis Bodewits, an astronomer at the University of Maryland College Park (UMCP). "These observations are part of a two-year-long Swift campaign to watch how the comet's activity develops during its travels." "Fresh" comets like Siding Spring, which is formally known as C/2013 A1, contain some of the most ancient material scientists can study. The solid part of a comet, called its nucleus, is a clump of frozen gases mixed with dust and is often described as a "dirty snowball." Comets cast off gas and dust whenever they venture near enough to the sun. What powers this activity is the transformation of frozen material from solid ice to gas, a process called sublimation. As the comet approaches the sun and becomes heated, different gases stream from the nucleus, carrying with them large quantities of dust that reflect sunlight and brighten the comet. By about two and a half times Earth's distance from the sun (2.5 astronomical units, or AU), the comet has warmed enough that water becomes the primary gas emitted by the nucleus. 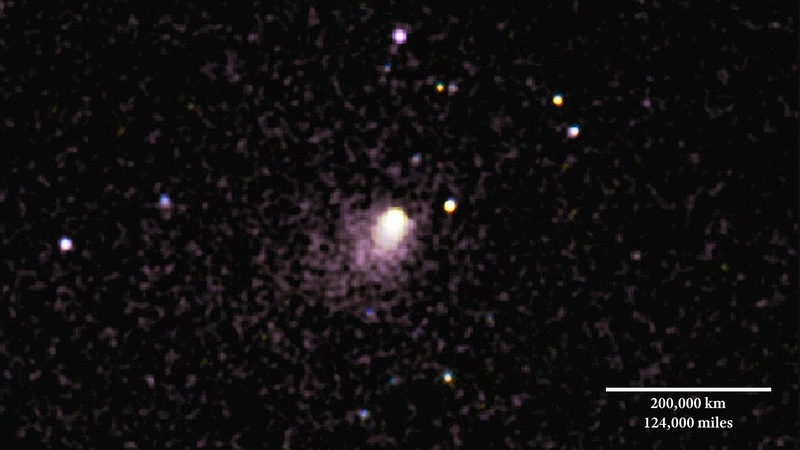 Between May 27 and 29, Swift's Ultraviolet/Optical Telescope (UVOT) captured a sequence of images as comet Siding Spring cruised through the constellation Eridanus at a distance of about 2.46 AU (229 million miles or 368 million km) from the sun. While the UVOT cannot detect water molecules directly, it can detect light emitted by fragments formed when ultraviolet sunlight breaks up water -- specifically, hydrogen atoms and hydroxyl (OH) molecules. "Based on our observations, we calculate that at the time of the observations the comet was producing about 2 billion billion billion water molecules, equivalent to about 13 gallons or 49 liters, each second," said team member Tony Farnham, a senior research scientist at UMCP. At this rate, comet Siding Spring could fill an Olympic-size swimming pool in about 14 hours. Impressive as it sounds, though, this is relatively modest water emission compared to other comets Swift has observed. Based on these measurements, the team concludes that the icy nucleus of comet Siding Spring is only about 2,300 feet (700 meters) across, placing it at the lower end of a size range estimated from earlier observations by other spacecraft. The comet makes its closest approach to Mars on Oct. 19, passing just 86,000 miles (138,000 km) from the Red Planet -- so close that gas and dust in the outermost reaches of the comet's atmosphere, or coma, will interact with the atmosphere of Mars. For comparison, the closest recorded Earth approach by a comet was by the now-defunct comet Lexell, which on July 1, 1770, swept to within 1.4 million miles (2.3 million km) or about six times farther than the moon. During its Mars flyby, comet Siding Spring will pass more than 16 times closer than this. Scientists have established that the comet poses no danger to spacecraft now in orbit around Mars. These missions will be pressed into service as a provisional comet observation fleet to take advantage of this unprecedented opportunity. The Swift observations are part of a larger study to investigate the activity and evolution of new comets, which show distinct brightening characteristics as they approach the sun not seen in other comets. Bodewits and his colleagues single out comets that can be observed by Swift at distances where water has not yet become the primary gas and repeatedly observe them as they course through the inner solar system. This systematic study will help astronomers better understand how comet activity changes with repeated solar heating.